Agiliron is a retail management system which enables businesses of all sizes to manage all of their orders, inventory and CRM records records from multiple sales channels in one location with a range of tools including multi-channel eCommerce, point of sale (POS), inventory management, order management, marketplace integration, CRM, business intelligence, and more. As a cloud solution, Agiliron gives users the flexibility to sell anywhere, anytime via any desktop, laptop, tablet or mobile device. Agiliron also supports offline access, allowing users to sell products even without an internet connection. Agiliron supports an unlimited number of stores and checkout lanes, as well as real-time inventory on products, pricing information management, customer receipts, multiple payment methods, and more, helping users manage the entire POS process conveniently online from a single and central location. Multi-channel eCommerce tools save users from logging into multiple systems to manage products listed on their website and various other marketplaces like Amazon and eBay. Agiliron captures any customer or order transactions in real-time, ensuring information is correct and up-to-date across all channels. Inventory and order management capabilities enable users to maintain stock levels, plus track, manage and fulfill orders with picking, packing and shipping management tools. Agiliron supports both B2C and B2B eCommerce, allowing users to sell products directly to consumers, as well as other businesses. Marketplace integrations help users manage their inventory accurately across multiple channels including eBay marketplace, eBay motors and eBay stores, plus Amazon marketplace, CommerceHub and SPS commerce. 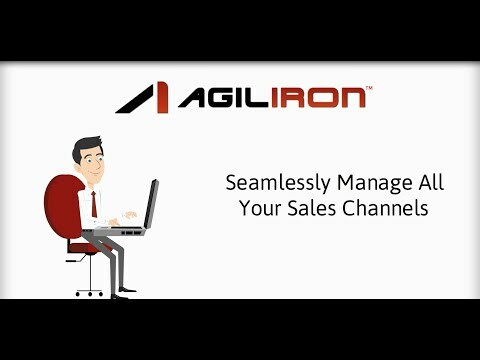 Users can track and manage their sales cycle as well as all customer activities and marketing campaigns from the Agiliron CRM. Business intelligence tools like standard/custom reports and dashboard analytics help give users actionable insight into their business and sales performance. Agiliron has helped our business grow dramatically, and consolidate our operations across many different vendors and sales channels. From regular eCommerce shipments, to vendor fulfillment, wholesalers, and even 3PLs we can keep all our orders and inventory data in one place which lets us manage many different relationships with comparatively small staff. The complexity of what Agiliron can do is generally intimidating to new staff and it can take a while to get them acquainted with the system, but once they understand it runs very efficiently and their customer service is very responsive when issues or questions arise. -Connects us to Amazon, eBay, Shopify, CommerceHub and EDI systems. Collects orders from all those sources as well as in-store and phone orders into one place, allowing for easy shipping and sales tracking. -Connected systems let our customer support personnel easily find accounts and orders and attach records from service calls. -Developers work to create tools for new business needs as they arise. -Connects us to Amazon, eBay, Shopify, CommerceHub and EDI systems. Collects orders from all those sources as well as in-store and phone orders into one place, allowing for easy shipping and sales tracking. -Connected systems let our customer support personnel easily find accounts and orders and attach records from service calls. -Developers work to create tools for new business needs as they arise. Agiliron has been a great company to work with. The number one thing to me is customer service. Agiliron representatives, particularly Parry, answers my questions almost always in a few hours. He built our whole system to start and has been with me, checking in periodically as well, since we started with Agiliron. The system is relatively easy to use once you are taught, but when you don't do it every day, you sometimes forget b/c not everything is logical. I would recommend Agiliron.Agiliron has provided our small business the opportunity to host an online store. This has helped increase visibility and sales. excellentI had a really great experience working with Agiliron throughout the entire sales process. They were extremely helpful with all of my questions, and I had a lot of them! Their rep was very patient and always available to answer my questions (even on weekends when he wasnt working he was replying to my emails quickly). There are many reasons why I chose this software and the excellent service certainly was one of them. This software offers a lot of great functionality for the user and once you get the hang of it, its quite easy to use. We look forward to working with the Agiliron team, as everyone I have spoken to has been very helpful and pleasant. I have recommended this program a lot over the years. You can easily fix mistakes that others have made. the pay liability section is good and bad, it is great if it is used ALL the time. • Marketplace integration with eBay, Amazon and CommerceHub allows users to manage product data across multiple accounts via the one Agiliron platform. • Agiliron supports mobile point of sale via native Android and iOS apps, enabling users to take orders anywhere, anytime. • Agiliron offers offline access, allowing users to accept orders even without internet access. • Track and manage the sales cycle, customer activities and marketing campaigns using the centralized CRM system. • Business intelligence tools (reports and dashboard analytics) help give users actionable insight into their sales, inventory, operational data, and more. Below are some frequently asked questions for Agiliron. Q. What type of pricing plans does Agiliron offer? Q. Who are the typical users of Agiliron? Q. What languages does Agiliron support? Q. Does Agiliron support mobile devices? Q. Does Agiliron offer an API? No, Agiliron does not have an API available. Q. What other apps does Agiliron integrate with? Q. What level of support does Agiliron offer?